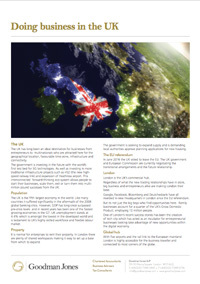 Setting up in a new jurisdiction is an exciting step for a business and the UK is a land of opportunity and advantages. See our guide on Doing Business in the UK. We have helped organisations from a range of countries including; Australia, Canada, France, Germany, the Gulf states, Ireland, Israel, Italy, The Netherlands Russia USA, and more. However, the UK tax code is a complex regime that can be a minefield for those not familiar with its intricacies. We see our role as hand-holding you and your business through what can seem to be an alien regime. We can provide a complete service to incoming business whether it is planning to establish a full permanent establishment or a simple UK-based support operation, or any permutation in between. We can benchmark to confirm the appropriateness of the inter-company prices charged. We can support you to ensure appropriate inter-company agreements are in place. We can guide you through the VAT implications of your operations as well as provide advice on specific transactions such as property acquisitions. Considering employment tax issues whether they are ex-pats relocating or new employment of locals. Helping employers evaluate the position regarding salary equalisation across countries. We can provide your on-going UK accounting and advise on modifications to your processes required for UK purposes. We can take care of your bookkeeping and management reporting using our online accounting systems. You can have secure instant access to your businesses books and records whenever you need them, wherever you are. You will receive accurate and timely financial information, and have the reassurance that your accounting records are maintained, up-to-date and reviewed for accuracy by our professional team. As part of this service we prepare the VAT Return and submit it to HMRC on your behalf. We can provide your on-going UK accounting technical accounting support. For example, if you wish to check the impact of a UL accounting policy or advise on modifications required for UK purposes. We are registered auditors and have considerable experience acting as auditor for the UK subsidiaries of international groups as well as UK consolidated accounts. We work to international auditing standards. We can provide full financial due diligence for acquirers of UK businesses. Provided domiciliation services for a French financial services business and provided IFRS Financial Statements. We helped a US company with the conversion of its standard US employment contract to a UK-compliant equivalent. The US business had not been aware that its standard contract could expose it to penalty under UK employment legislation. We conduct the UK audit for a subsidiary of a German listed Group. We provided support and tax advice in the respect of a sale of a UK subsidiary of a US parent. We have produced management accounts to facilitate easy decision making across multiple currencies whilst ensuring that VAT returns are filed in GB Pounds. Helping an international group register for VAT overseas. Advising on exporting goods to non-EU countries. Advising on VAT implications of selling services to EU member states under the reverse charge mechanism. Audit of worldwide group with UK parent.